The Pictish site was initially recognised in 1974 after the landowner JLM Younie found a fragment of a class 1 symbol stone (c. 7th C AD) whilst digging in one of the barrows and reported this to archaeologists. The site was excavated by soon after by Laurie M Wedderburn and Dorothy Grime. Their aim was to glean as much information as possible from the already disturbed structure and to try to prove whether the structure and symbol stone were contemporary. Fragment of Pictish symbol stone found at Garbeg, showing how the design may have continued. The stone is now in the Inverness Museum. 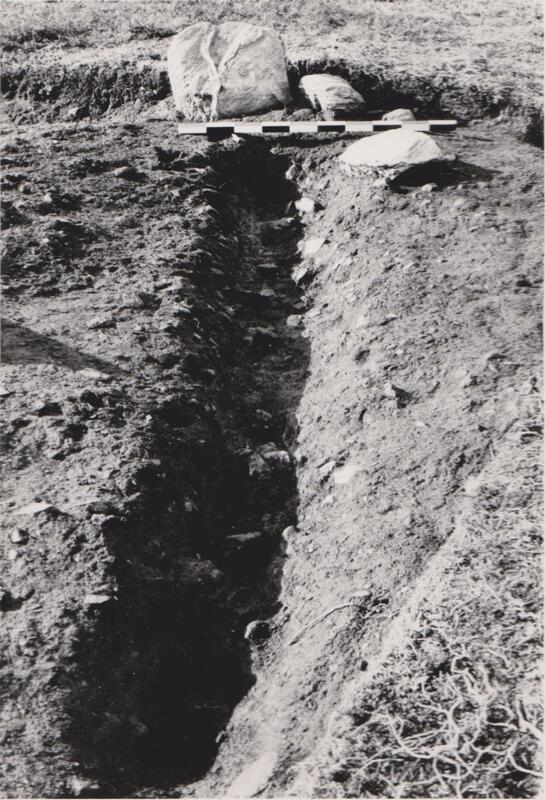 A total of four trenches were dug across barrows at Garbeg. Of particular interest was one of the square barrows where baulks had been left at each corner of the surrounding ditch and here a small boulder had been placed. 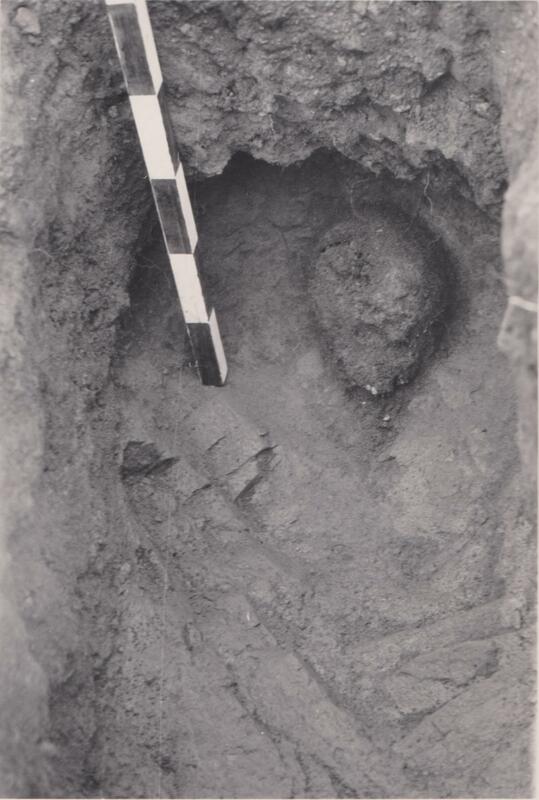 At the centre of this barrow was a rectangular stone setting measuring 2.4 x 1.7 m with an E-W orientated long grave beneath. From this grave were recovered a human skull and femur. Similar structures were found in the two other trenches, whilst in an outlier, the central pit had been lined with boulders to form a massive cist. Close-up of barrow ditch with baulk and boulder at the corner (courtesy of Laurie and Dorothy Wedderburn). Only one other barrow yielded definite finds in the form charcoal, calcined bone and an undecorated pottery fragment; categorised as Scottish ware dating from the 1st millenium BC onwards. Unfortunately no clear statigraphic relationship could be established between the stone and the barrow, however this may have been due to the disturbance prior to excavation. Radiocarbon dating results from Garbeg have proved to be problematic. The skull and femur fragments were recovered from barrow no. 3 (see plan above, the symbol stone was in no.1). These skeletal remains were tested 10 years after excavation in 1985, achieving a date of 990 bp +/-50, calibrated to AD 900 to 1190 (http://canmore.org.uk/c14index/12633). Even at the oldest end of the range this would place our individual in what is usually thought to be the post Pictish era. Subsequently the bones were retested in 2013 as part of the University of Aberdeen’s Northern Picts Project. This time they attained a result of 933 bp +/- 33, calibrated to AD 1035-1155. If correct then the burial date might be 4 or 5 centuries later than the carving of the symbol stone and well into the period where we might have expected church burials to be the norm. However, I corresponded with Kate Britton of the University of Aberdeen who pointed out that d13C values were suspiciously low, and on the carbon and nitrogen mass spectrometry data the C/N ratio was very high. This meant that although the date could be genuine, it is also quite possible that the collagen sample is either contaminated or poorly preserved leading to unreliable results. Kate doubted that the original 1985 RC dating incorporated the assessment of collagen preservation at all, so these reservations may have slipped the net previously. 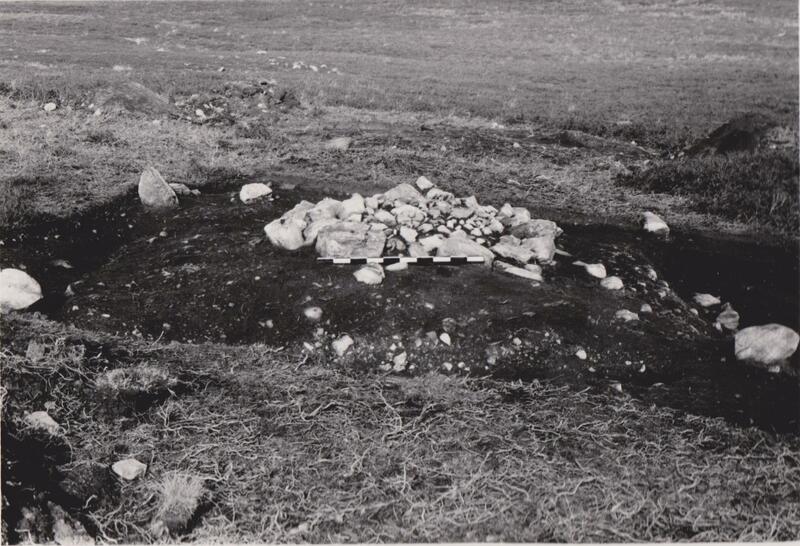 Human remains in situ at Garbeg (courtesy of Laurie and Dorothy Wedderburn). 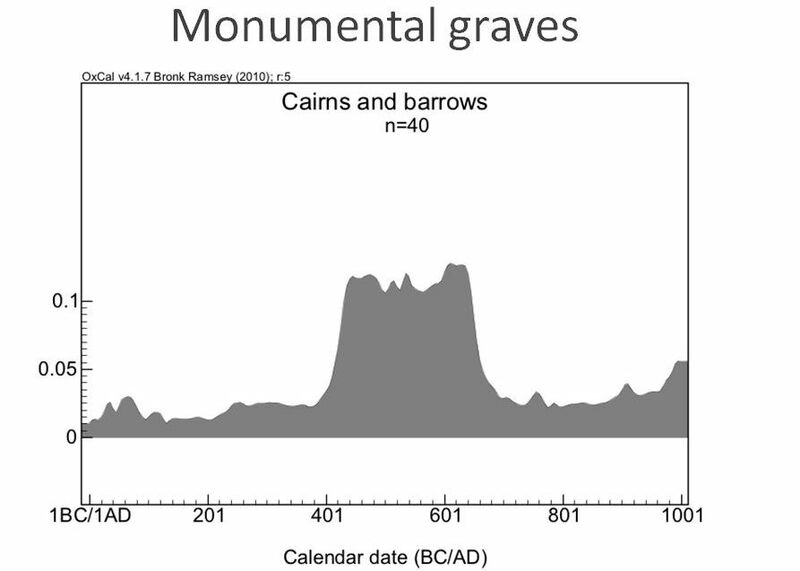 Graph shows an amalglamation of all c14 date results available for cairn and barrow graves in Pictish cemeteries tested as of 2014 (Adrian Maldonado). The commonest date is between 400 and 600 AD which is much closer to the result we might have expected for Garbeg. Although some of the barrows can be difficult to pick out today, in the period of their use they would have stood taller and their ditches would have been more defined. There may also been associated markers or upright stones on graves which are no longer visible, or indeed at the corners of the square barrows as discussed above. Garbeg is one of a group of burial sites that have been found in association with class 1 symbol stones. The others include Dunrobin, Tillytarmont, Waternan and Ackergill. At Dunrobin in Easter Ross, the symbol stone originally stood upon a rectangular cairn beneath which skeletal remains in a cist were radiocarbon dated to the 6th to 8th centuries AD. An artist’s impression of a Pictish burial (Mike Moore). 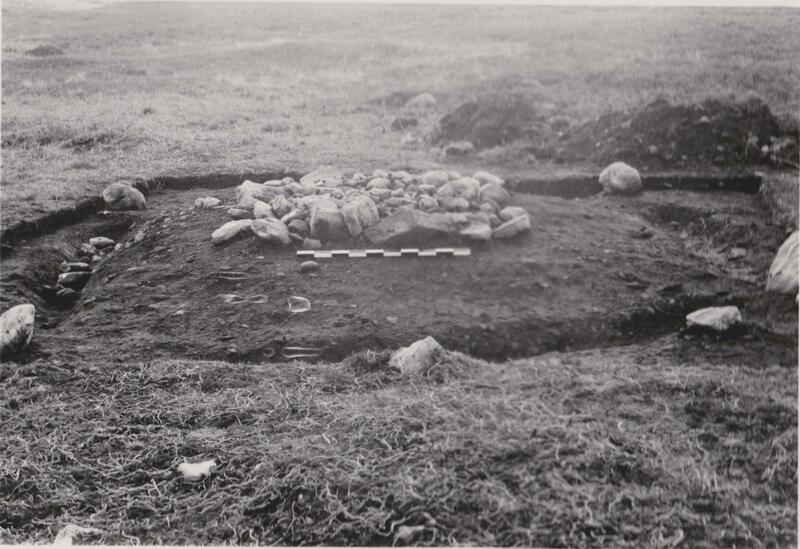 A body is being placed into a long cist grave, whilst the monument in the background has standing stones at each corner and a symbol stone set on top of the cairn. 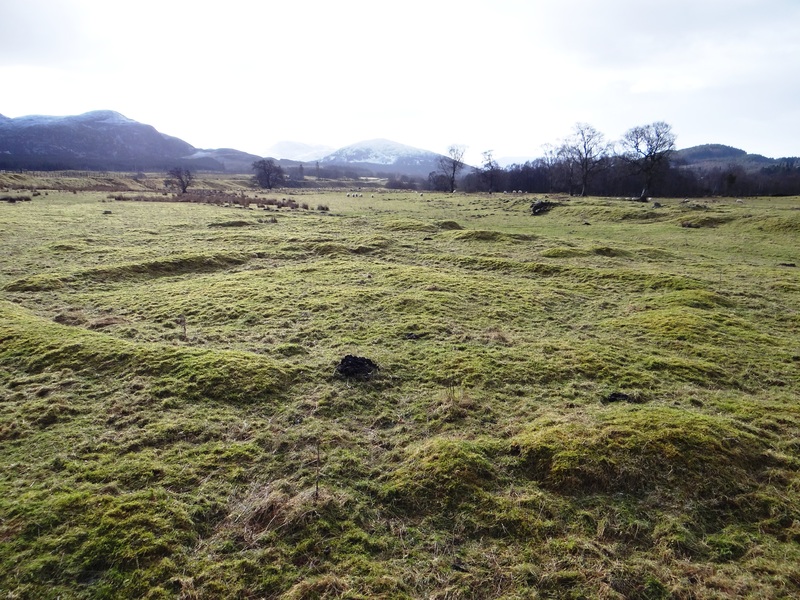 The cemetery site at Whitebridge, in Stratherrick (Canmore ID 12281, HER MHG2637), comprises four square barrows, two ditched round barrows as well several unditched cairns. They lie on two adjacent gravel terraces separated by an old river channel. Although there are fewer structures than at Garbeg, it is possible that historic river erosion and later agriculture/ settlement have curtailed a site that was once more extensive. As late as the sixties, Whitebridge was still being incorrectly described as a camp associated with the military road of c 1725. The post medieval reuse of the site with corn drying kiln and various buildings, plus tattie pits on the the river terrace to east seems to have confused identification further. Only in 1979 did the OS survey note that “these structures were re-examined in the light of new evidence.” This evidence was largely provided by the advent of aerial photography identification of barrow sites in the seventies. In most cases these have been recognised only through crop marks, since upstanding barrows have proved especially vulnerable to the depredations of the plough. Many similarities have been found between Garbeg and Whitebridge, so much so that barrow cemetries can be described as being of the Garbeg/ Whitebridge type. These are “characterised by containing low flat mounds surrounded each by a small ditch, by the presence of rectangular or trapezoidal mounds in addition to circular ones, and by the presence of gaps at the corners of the ditches of the straight-sided mounds” (Ashmore, 1980). The main differences between the two are that the Whitebridge barrows are slightly bigger in area and that they have outer banks, which are largely absent from their Garbeg counterparts. Also, whilst the corners of the square barrows have gaps both at sites, at Whitebridge no corner stones have been detected (see OS 1979 conclusions on Canmore ID 12281). 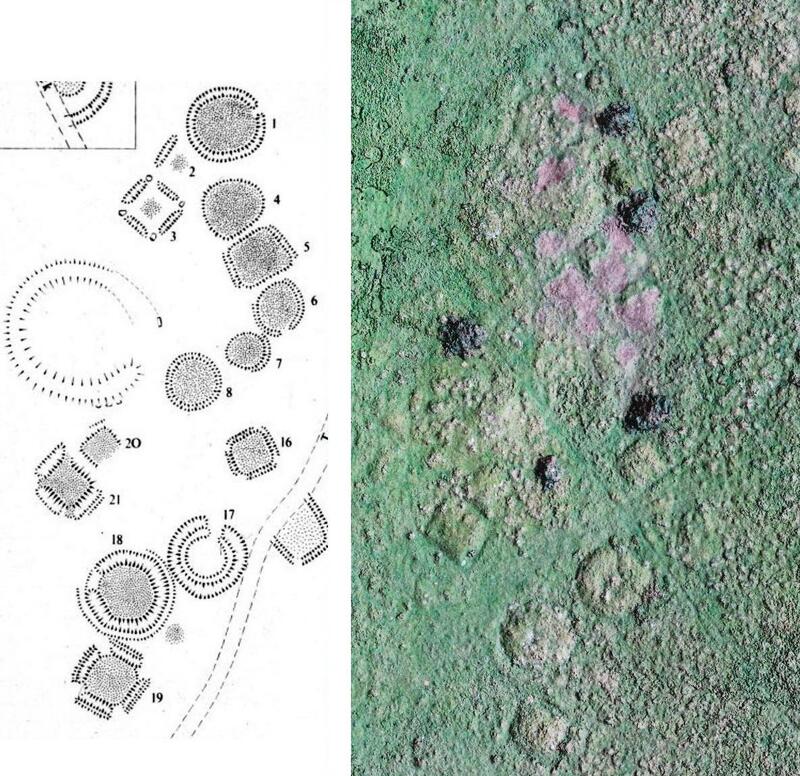 All the individual barrow features seen at Garbeg and Whitebridge can also be seen found at much older sites; it is the combination of barrow types occurring together – round and square, ditched and causewayed – that identify them as Pictish. 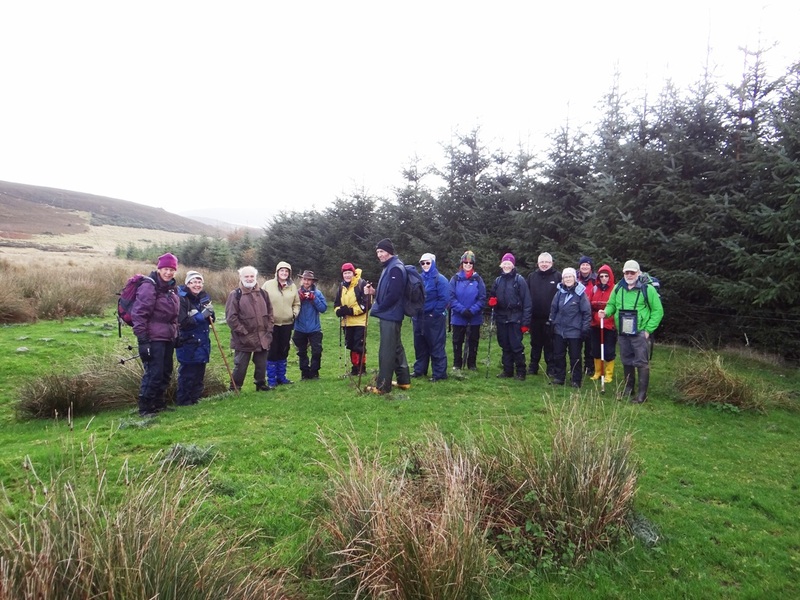 The only excavation to date at Whitebridge has been a very limited one in 1999, carried out due to a fallen tree which had clipped the edge of one unditched cairn. 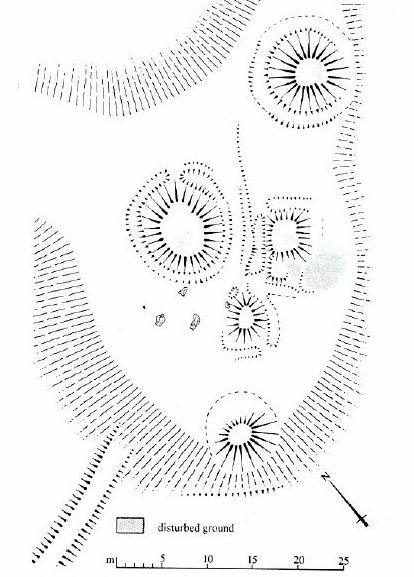 Here it was noted that no trace of a surrounding ditch or bank was recovered and there were no indications of a burial ground surface below the cairn (see the Data Structure Report). Unlike Garbeg therefore, no skeletal remains or other artefacts have been recovered which might provide dating confirmation. 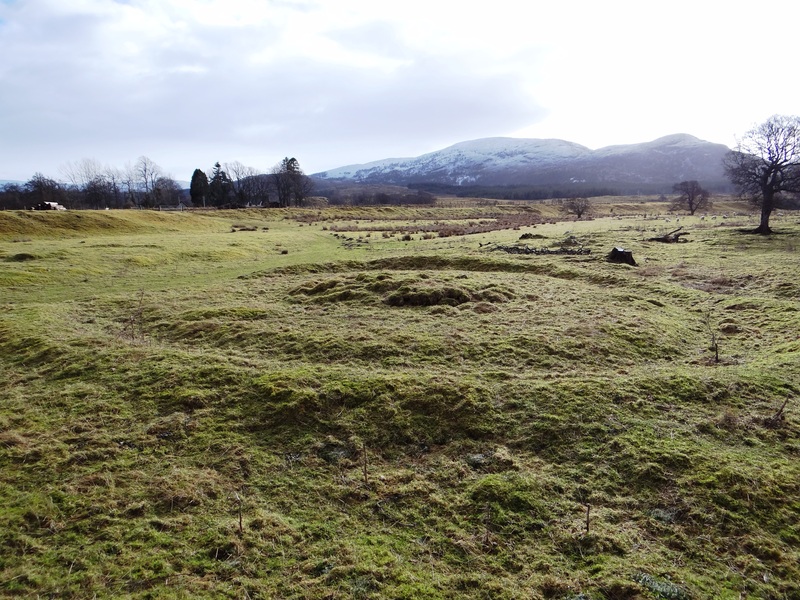 One further upstanding barrow site which NOSAS visited on the same day as Whitebridge can be found at Brin Nursery, Stratherrick – Canmore ID 78792. This is another possible cemetery originally classified as a result of aerial photography. Here there are four round barrows and what may be two conjoined square barrows with causeways. Although the features are by no means as defined as at Garbeg or Whitebridge, the similarties are striking enough to make for an interesting comparison. 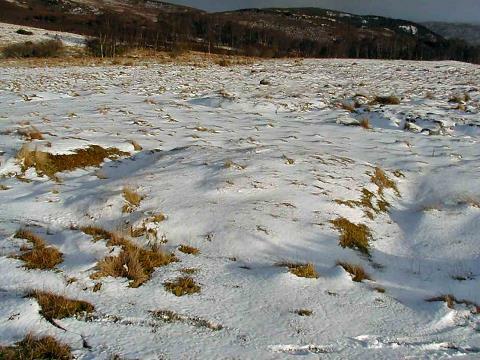 Another highland barrow site with markedly shared characteristics can be seen at Pityoulish near Aviemore (Canmore ID 15389). 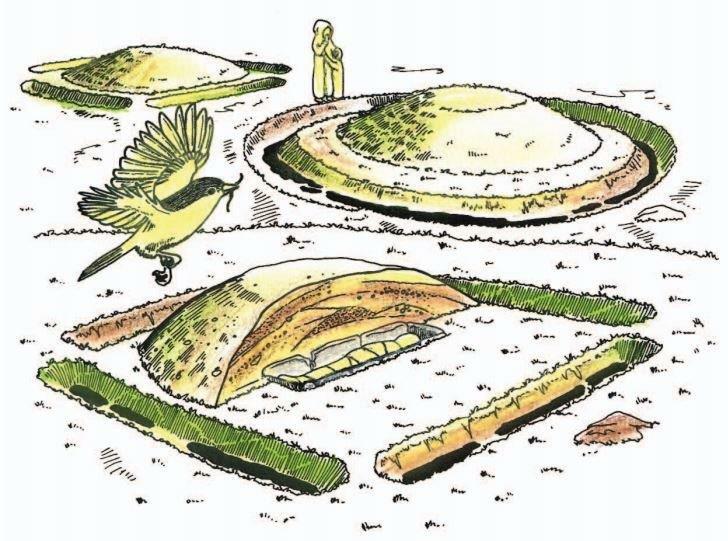 Drawing of Brin Barrow Cemetery (RCAHMS). A barrow is usually defined as a mound of earth, or of earth and stones, used to cover one or more burials. By contrast, a burial cairn is strictly speaking constructed entirely of stone. 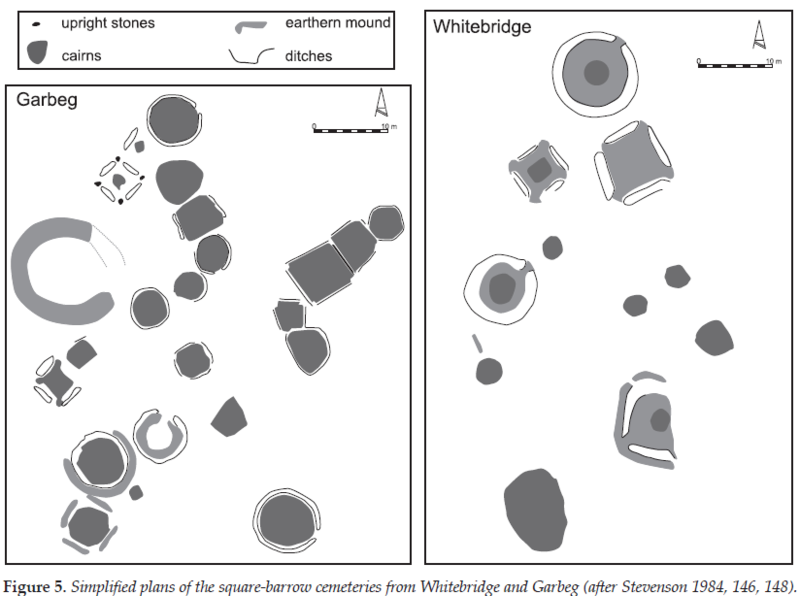 Some past commentators however do describe the mounds at Garbeg and Whitebridge as cairns. This can be somewhat confusing, especially since both sites do also feature cairns in the vicinity which are probably not burials. 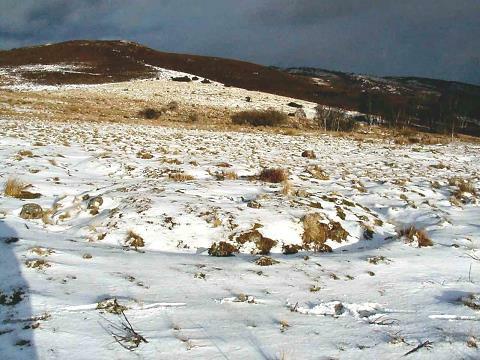 There is indeed an extensive cairnfield at Garbeg which is more likely associated with prehistoric farming. Stone Pictish burial cairns, both square and round, however do occur on several other sites such as Ackergill and Dunrobin. 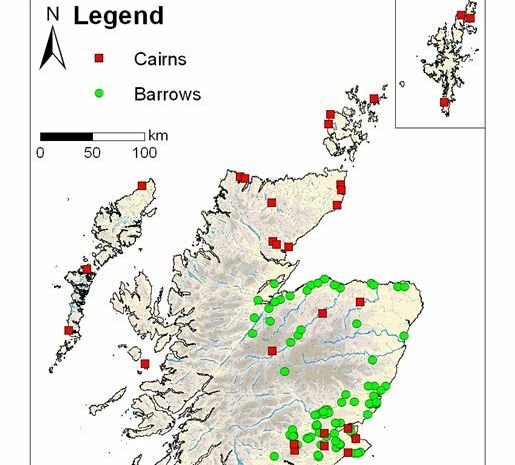 The diagram below shows the distribution of Pictish cairn and barrow cemetery sites in central and northern Scotland. There is a mixed picture in the south east of the region, but in the central highlands, Moray and Aberdeenshire barrows seem to predominate. In the far north and west however only cairn burials have been identified. Distribution of Pictish cairn and barrow cemetery sites (Adrian Maldonado). Many thanks to Laurie and Dorothy Wedderburn, Kate Britton, Fiona Younie, Oskar Sveinbjarnarson, Juliette Mitchell and numerous members of NOSAS – especially Jonie Guest. Very interesting and well researched.